We’ve never conducted a scientific survey, but we suspect that if asked to name the perfect food, nine respondents out of 10 would say “chocolate.’’ But even chocolate comes in good, better, and best. In Massachusetts, we are richly endowed with chocolatiers dedicated to the further perfection of the perfect food. They see their craft as both an art and a way of life, and Valentine’s Day, above all, is their day. Kathie Williams, who runs Richardson’s Candy Kitchen in Deerfield with her mother, Barbara Woodward, confirms the stereotype that real men buy chocolate at the last minute. “On Valentine’s Day,’’ she says, “the parking lot is full of trucks.’’ Two of the shop’s Valentine’s Day specialties are a stemmed cherry dipped in ganache and then chocolate, and dried apricots dipped in chocolate and sprinkled with pistachios. Richardson’s is also known for dixies (turtles entirely enrobed in chocolate) and hedgehogs (similar but made with crisped rice). For hard-nosed regional traditionalists, the women also make pink wintergreen mints as both chocolate patties and dipped creams. “It’s a real New England flavor,’’ Williams says, noting that many of the recipes are original with the founder of the 55-year-old shop. Chocolate never seems to go out of style, making candy shops typically long-lived businesses. A sign in the back of Hebert Candy Mansion in Shrewsbury proclaims, “Making your day a little sweeter since 1917,’’ the year Frederick Hebert started up the confectionery. He moved his operations into the Candy Mansion in 1946, which the company claims is America’s first roadside candy store. The joint will be jumping today - “We’re expecting a line of 50 or 100 guys in the parking lot when we open at noon,’’ a clerk said - but if you show up on a weekday, you may actually get to see the candy makers at work behind glass in the store’s kitchen. Traditional boxed chocolates are the big draw here, though the Hebert signature candy is the bite-sized block of white, milk, or dark chocolate called a Geneva, available with or without an almond on top. Perhaps the most truly European candy in Massachusetts is the Viennese truffle of Serenade Chocolatier in Brookline Village. The original recipe came from William “Uncle Bill’’ Federer, who grew up in Vienna, sang in the legendary Vienna Boys Choir, survived the Dachau concentration camp, and opened Serenade in 1960. Federer taught the recipe to current owner Nur Kilic, and the layered treat of dark chocolate and hazelnut butter remains a signature of the shop. The second edition of “Food Lover’s Guide to Massachusetts’’ (Globe Pequot Press) by Patricia Harris and David Lyon will be published next month. They can be reached at harris.lyon@verizon.net. 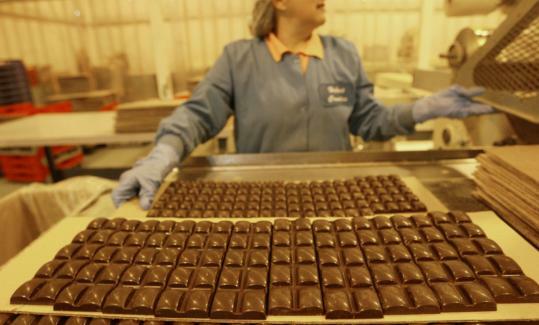 Some chocolatiers may keep extended hours on Valentine’s Day. Call to check.